Do you think you’ll be hanging around Stuyvesant Plaza next Saturday, November 6? If so, stop by the Book House and sign my autograph book. I’ll definitely be there around/at 11:20 because that’s when I’ll be reading part of “To Kill A Mockingbird” in the “Mockingbird Marathon: To Kill A Saturday.” A bunch of people are going to take turns reading the whole book starting at 9am and finishing up around 9pm. It’s a little 50th anniversary party for the book! 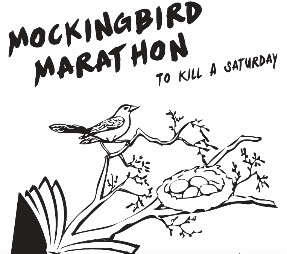 Have fun on the Mockingbird Marathon Face Book page here and read mockingbird tweets here. This entry was posted on Sunday, October 31st, 2010 at 7:30 pm and is filed under News. You can follow any responses to this entry through the RSS 2.0 feed. Both comments and pings are currently closed.